When light is incident on a surface (smooth or rough), it must obey the laws of reflection. There are first and second laws of reflection. When light is incident on a smooth surface, we will get a regular reflection. When light is incident on a rough surface, we will get an irregular or a diffused reflection. Can you think of a few examples of smooth and rough surfaces? the size of your image and the size of your object must be the same. You don’t look bigger or smaller in the mirror. Do you? the distance from the object to the mirror = the distance from the image to the mirror. Try moving away or toward the mirror, you should see that your image will do the same thing in order to obey this property of equi-distance. your image will be considered to be upright. It means that your head should not be supporting your head while you are standing on the floor and looking at yourself in the mirror. If that is what you see, we will say that the image is inverted. the image is virtual. Being virtual means that the image cannot be captured on the screen. Try to project the image of yourself (formed by plane mirror) onto any screens. Can you do it? image is laterally inverted or sometimes we say it is front-back inverted. Both ways are acceptable as they are trying to describe the observation from different perspectives. Nonetheless, in ray diagram, you will see that front-back inversion is more applicable and consistent with what we see. But in real life, what we often notice is that when we move our right hand, the image’s left hand is the one that is moving. This is the time when “laterally inverted” shines. We know that if we stand in front of a mirror, we will only see one image of ourselves. What if we have multiple mirrors? What if those mirrors are arranged not perpendicular to each other? There is a formula that allows us to determine the number of images = 360/θ – 1 where θ is the angle formed between the two mirrors ( by the reflective sides). NOTE: We are interested in whole image and not partial image. I would suggest that you try to apply your ray diagram knowledge here to fully understand how these images are formed. 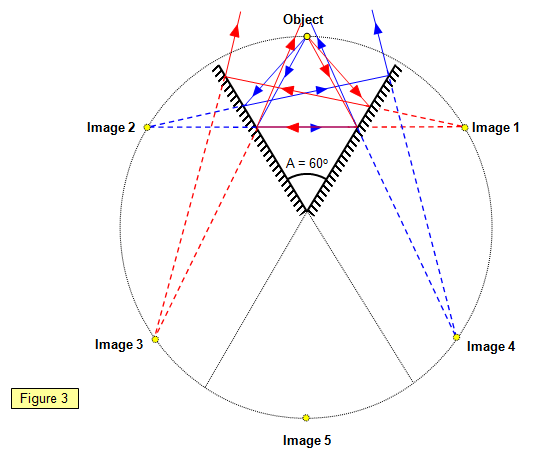 Below is the ray diagram of the images formed by two mirrors at 60o. Perhaps now it is a good time for you to predict the total number of images formed when the mirrors are perpendicular to each other and then draw the ray diagram for it. Our normal glass is not transparent to ultraviolet. It means that ultraviolet cannot pass through glass. Similarly, infrared radiation is facing similar issue with ultraviolet. However, our visible light breezes through glass. Why? Hint: When electromagnetic waves are incident on glass, the electrons of glass atoms are set into vibration. Some frequencies cause the vibration to be more significant. The more significant the vibration, the more heat is produced instead. Some frequencies even cause the entire atom to vibrate.